The International Space Station's last set of U.S. solar arrays are slightly deployed in this predawn view from exterior cameras caught on March 20, 2009. The arrays were to be fully extended later that day. With the Space Shuttle Discovery scheduled to undock from the International Space Station (ISS) on Tuesday, skywatchers across much of the United States and southern Canada are in for a real treat on Tuesday and Wednesday evenings. Weather permitting, there will be a few opportunities to see both the Discovery orbiter and the ISS flying across the sky from many locations. 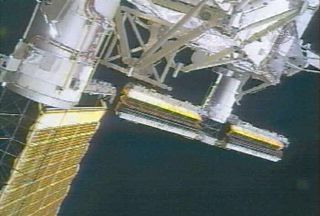 Shuttle Discovery is expected to undock from the ISS at 3:27 p.m. Eastern Daylight Time on Tuesday. Discovery will fly around the ISS before finally pulling away from the Station at 5:10 p.m. EDT, although it should still remain at a relatively close distance to it until its scheduled return to the Kennedy Space Center in Florida Thursday. Both vehicles will be traveling across North America on southwest-to-northeast trajectories. Appearing as a pair of very "bright 'stars," the ISS should appear as the somewhat brighter object and will be trailing Discovery as they move across the sky. A large telescope would be needed to make out details of the sprawling station. Traveling in their respective orbits at approximately 18,000 mph (29,000 kph), both should be visible anywhere from about one to five minutes (depending on the particular viewing pass) as they glide with a steady speed across the sky. On favorable passes, it approaches magnitude -5 in brightness, which would rival the planet Venus and is more than 25 brighter than Sirius, the brightest star in the night sky. Some have even caught a glimpse of the ISS just prior to sunset or shortly after sunrise. And as a bonus, sunlight glinting directly off the solar panels can sometimes make the ISS appear to briefly flare in brilliance. Generally speaking, the tandem will be visible across southern Canada and most of the 48 contiguous United States (Hawaii and Alaska, unfortunately will not have favorable viewing passes during this upcoming week). Across southern Canada as well as the Pacific Northwest, Northern Plains and Northeast states, there will be three, and in a few cases, as many as four evening viewing opportunities. Over California, the central Rockies, the Midwest and the Carolinas, there will be two opportunities, while over the Desert Southwest and Deep South, the viewing options are reduced to just one.